Dave Atcheson is an avid sport fisher and hunter and is the author of National Geographic's Hidden Alaska: Bristol Bay and Beyond and the guidebook Fishing Alaska's Kenai Peninsula. He has written for a variety of periodicals, from Outdoor Life to Boys' Life, and is a frequent contributor to Alaska Magazine and past contributing editor for Fish Alaska Magazine. His latest book is Dead Reckoning, Navigating a Life on the Last Frontier, Courting Tragedy on its High Seas, a memoir on his days as a commercial fisherman. Originally from upstate New York, Atcheson teaches fly fishing and has run the Kenai Fishing Academy at the University of Alaska Anchorage, Kenai Peninsula College. He has also worked for the Alaska Department of Fish and Game and for a variety of conservation organizations, protecting Alaska's vast and still intact fisheries. He is past president of the Renewable Resources Foundation and currently works with the Trout Unlimited Alaska Project. He has lived and traveled extensively throughout the 49th state, today making his home on the Kenai Peninsula, in Sterling, Alaska. Dead Reckoning: This is the true story of a journey to a seaside town and the always unpredictable torrent of dark escapades that accompany a life at sea. It’s a story of a world peopled by those who often live on the frayed edges of society, who shun the world in which most people thrive. It’s a story in which college students and “fish hippies” work in canneries alongside survivalists, rednecks, religious freaks, and deckhands with damning secrets in dangerous waters, driven by the need to feed an insatiable appetite for adventure. This is the heart of the world Atcheson found himself in at the age of eighteen. Having never even seen the ocean, he took his first job on the Lancer with Darwin Wood, a man so confounding, so complex and so frightening, that it’s hard to believe Atcheson walked away from that job unscathed. Forced to buddy up with a murderer in order to cope, Atcheson began to question his deeply ingrained ideas of success and status. The resulting conflict would finally resolve itself fifteen years later, in the least likely of places: on the Bering Sea, aboard a boat in peril, during a night of terror that would reshape the lives of everyone involved. Reminiscent of The Perfect Storm and Into the Wild, Dead Reckoning is not only an intimate look at life at sea, but also an insider’s view into one of Alaska’s small communities, and the myriad of upstarts, dropouts, and rogues that color its landscape. Hidden Alaska: A stunning visual story of a place of wonder and mystique for every American, this book features what is legendary and beloved about Alaska, a land of magnificent wilderness and beauty, virtually untouched by human ambition. It also focuses on the key point of interest in the state today: endangered Bristol Bay, which faces potential mining of the world's greatest deposits of copper and gold. Its pristine waters are the worlds' biggest salmon spawning grounds. If the gold is mined, the ecosystem is destroyed —but the impoverished locals have work for the next half-century. After that, the salmon and the mines are gone. Melford, paired with noted environmental storyteller David Atcheson, addresses the dilemma by bowling us over with the beauty and importance of the place for all time. 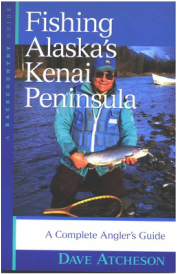 Fishing Alaska's Kenai Peninsula is not merely a reference guide. It showcases the uniqueness of Alaska while emphasizing the universal passions that make the sport of fishing so compelling. With stories and anecdotes to complement the detailed specifics on stream access, timing, tactics, and equipment, this fascinating book will appeal not only to those planning a visit but to all those who have a love of fishing and only dream of going. Atcheson provides information on both fly fishing and conventional spin casting in both fresh and salt water. He covers every style of fishing from jigging for giant halibut off the coast, to float tubing for grayling and monster rainbow trout on quiet mountain lakes, to pursuing all the species of salmon that run up the streams of the Kenai Peninsula to spawn. He supplies detailed information on the well known "combat zones" that are so renowned for their large salmon and trout that anglers line up shoulder to shoulder in their pursuit. In addition, there's hard-to-find information on those out-of-the-way, beautiful stretches of water where one can still enjoy the beauty and the blessed solitude of the Alaskan wilderness. 30 black and white photographs, 5 illustrations, 10 maps, index.